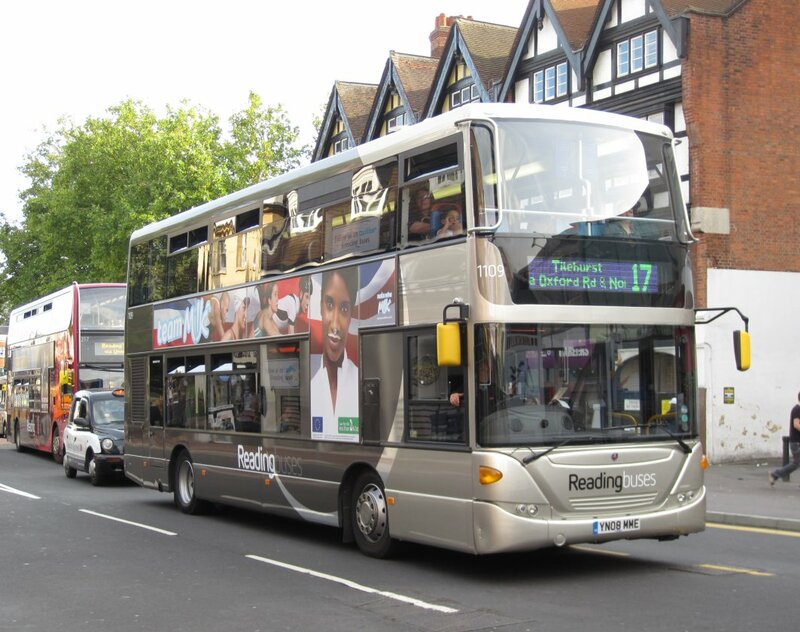 Reading have a total of 15 OmniCity double deckers, which are based on the Scania CN270UD chassis. 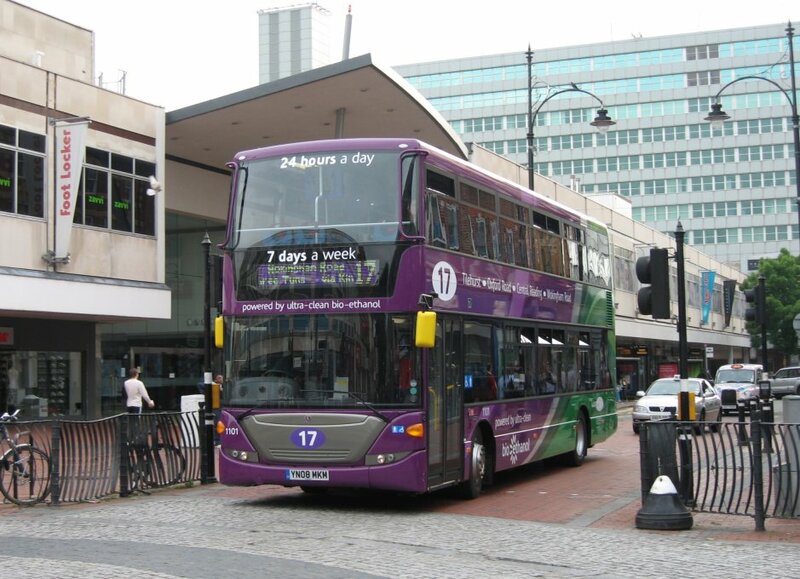 The first fourteen, 1101-14 were introduced onto route 17, which from 26 May 2008 became a 24-hour service, operating every hour all night (and half-hourly on Friday/Saturday nights). 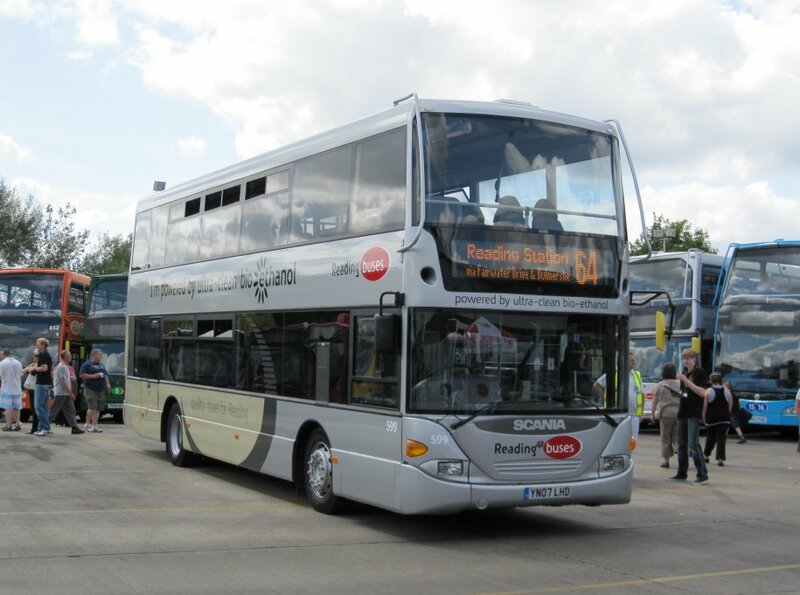 They were originally due to arrive for launch at the end of April 2008, but over optimistic scheduling by Scania meant that in the end delivery dates were as follows: 1101 on 23rd April, 1102/3 on 15th May, 1104/5 on 20th May, 1106/7 on 22nd May, 1108 by 27th May, 1109/10 on 6th June, 1112 on 11th June, 1111/13 on 12th June and 1114 on 25th June. The vehicles were all initially fitted with ethanol powered engines, and intended to run on ethanol produced as a by-product of the sugar refining process at a factory in Norfolk using sugar beet grown in Britain. Carbon emissions from an ethanol engine are 40 per cent lower than a Euro 5 diesel engine, and smell slightly different. However as recession struck during 2009 the higher running costs of ethanol powered vehicles, primarily due to their much higher fuel consumption and the limited difference in fuel price, meant that a decision was made to convert them to run on standard diesel. It also turned out that the source of the ethanol being used has been switched to that produced by a Wood Pulp factory in Sweden, which whilst still a very green by-product wasn't local. The vehicles were finished to a high internal specification to make them stand out from similar looking diesel powered vehicles in the fleet, as otherwise the vehicles would look and sound like any other. 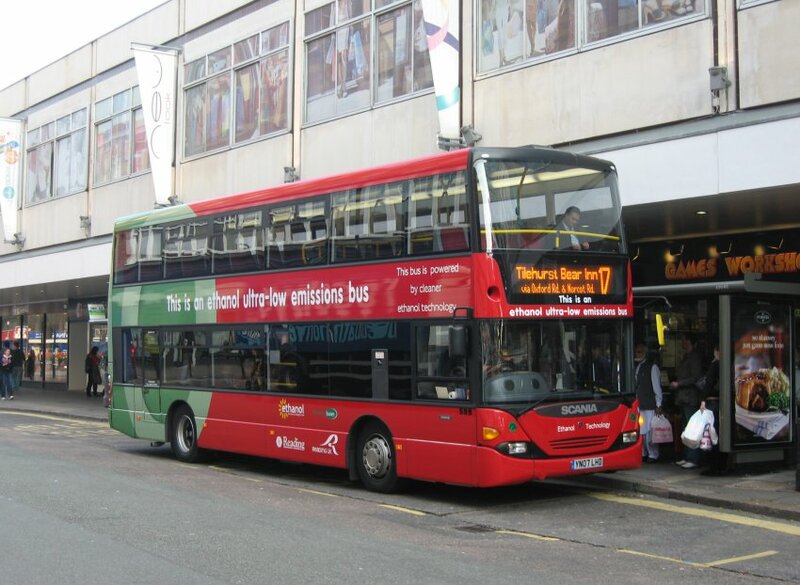 They feature full colour Hanover LED destination displays, leather seats stitched with the Reading Buses logo and an air chill system on the top deck. The remaining vehicles had the "I'm powered by sugar waste!" message removed on or around the weekend of 17/18th October 2009 following the discovery that the source of the ethanol had been changed to Wood Pulp. Conversions from ethanol to diesel commenced in December 2009, taking approximately one week per vehicle. The first to be treated was 1107 by 16th December 2009, followed by 1101 which returned to service by 29th January 2010 following delays sourcing parts. The third vehicle was 1103, with work underway by 1st February and completed by 10th. 1102 and 1111 were also completed by 10th February. 1113 was completed by around 24th February, followed by 1110 which was back in service by 6th March, 1104/9 by 13th March, 1106/8 by 23rd March and 1105 by 2nd April. There was then a short break whilst the remaining ethanol stocks were used up with 1114 converted by 11th May and 1112 by 15th May. 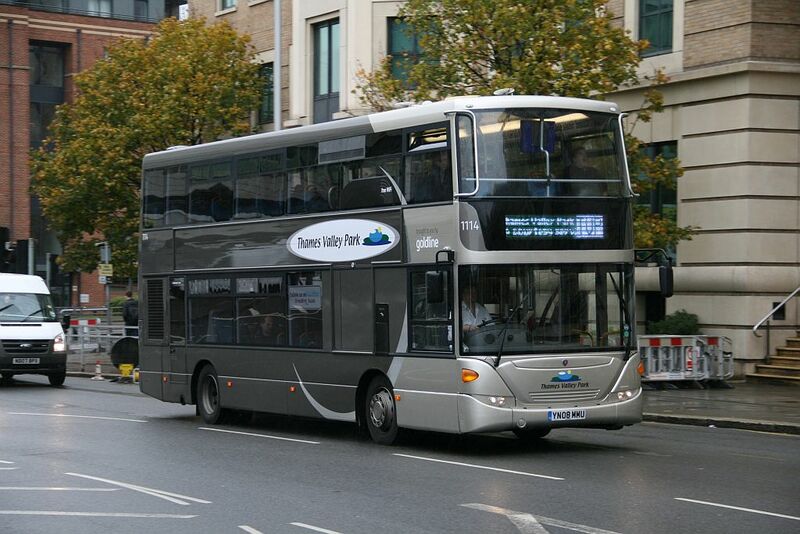 1101 to pink routes livery, departing on approx 12th August 2011 and returning to service on 25th. Leather seat coverings were replaced with moquette by 7th January 2012. 1102 to pink routes livery, returning to service on 6th September 2011. Leather seat coverings were replaced with moquette between 17th June and 20th July 2012. 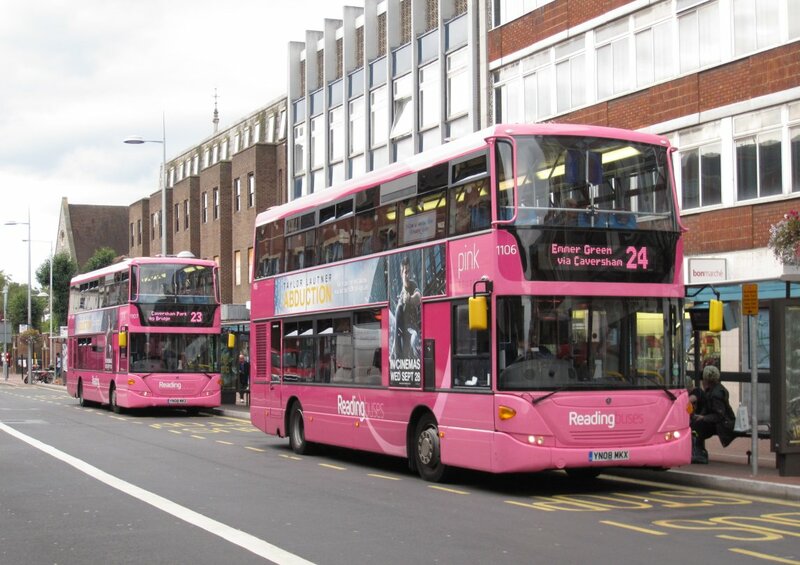 1103 to pink routes livery, returning by 11th September 2011. Leather seat coverings were replaced with moquette by 29th January 2012. 1104 to pink routes livery, departing by 14th September 2011, returning by 24th and returning to service on 26th. Leather seat coverings were being replaced with moquette on 6th May 2012. 1105 to pink routes livery, returning to service by 16th September 2011. Leather seat coverings were replaced with moquette between 31st October and 12th November 2011. 1106 to pink routes livery, returning to service by 10th September 2011. Leather seat coverings were being replaced with moquette on 16th October 2011. 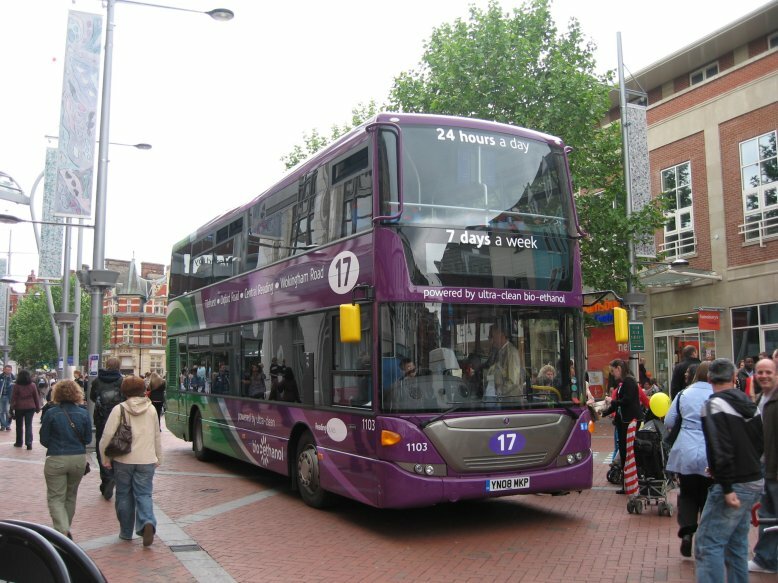 1107 to pink routes livery, returning to service by 27th August 2011. Leather seat coverings were replaced with moquette by 22nd April 2012. 1108 to generic livery, at Hants & Dorset trim by 14th September 2011, returning to service by 21st. Leather seat coverings were replaced with moquette in August 2012. 1109 to generic livery, returning by 11th September 2011. Leather seat coverings were replaced with moquette between 6th May and 2nd August 2012. 1110 to unbranded generic livery, departing for Hants & Dorset Trim on 6th July 2011, returning on 15th July and back in service by 21st July. Leather seat coverings were replaced with moquette at the same time. 1111 to unbranded generic livery, departing for Hants & Dorset Trim on 15th July 2011, returning on 1st August and back in service by 6th August. Leather seat coverings were replaced with moquette by 22nd April 2012. 1112 to unbranded generic livery, departing for Hants & Dorset Trim by 1st August 2011, returning by 13th and back in service by 15th. Leather seat coverings were replaced with moquette sometime between mid April and 17th July 2011. 1113 to unbranded generic livery, at Hants & Dorset trim by 22nd August 2011, returning to service by 6th September 2011. Leather seat coverings were replaced with moquette by 5th January 2012. 1114 to unbranded generic livery, at Hants & Dorset trim by 12th August 2011 and returning to service by 22nd. Leather seat coverings were replaced with moquette during July 2012. 1110-2 lost their Thames Valley Park branding in favour of Reading Buses logos following the introduction of a more frequent single deck service to Thames Valley Park from 13th February 2012, and 1113-4 following the loss of the Thames Valley Park contract on 28th September 2012. In April 2014 generic liveried 1110/11 had their lower saloon seating reworked to create more buggy space with the removal of two seats, with 1112-14 to follow. 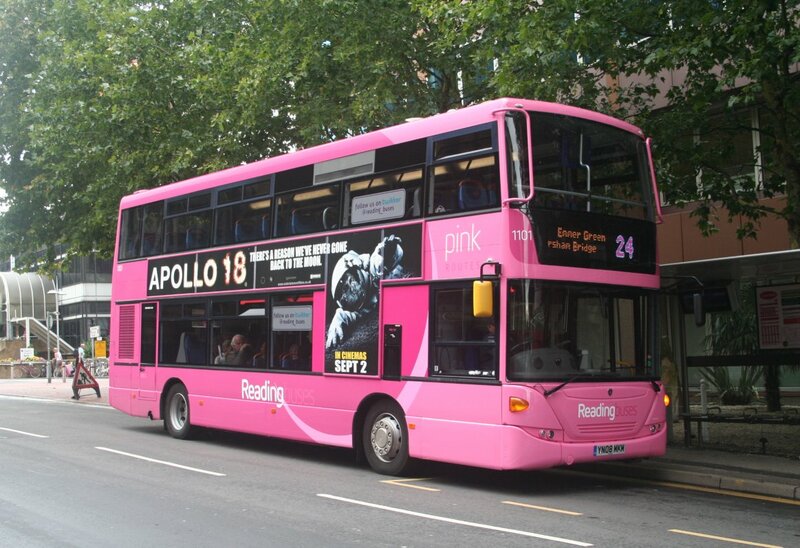 In September 2014 pink 1107 and silver 1108 were designated as the vehicles for use on new Green Bus services to Reading College. They continued to run in their existing liveries, although 1107 lost its advertising frames, gaining an advertising livery for the college on 14th September 2014. 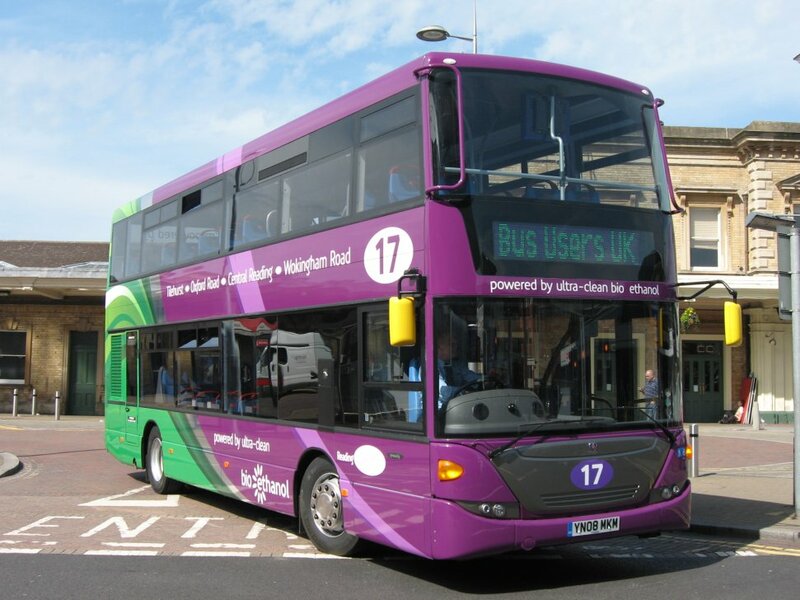 The two workings were amalgamated from September 2015 and withdrawn in September 2016, with 1107 becoming a regular spare vehicle for the pink and sky blue routes. 1106 and 1112 lost their full colour destination displays in favour of standard orange in November 2016. 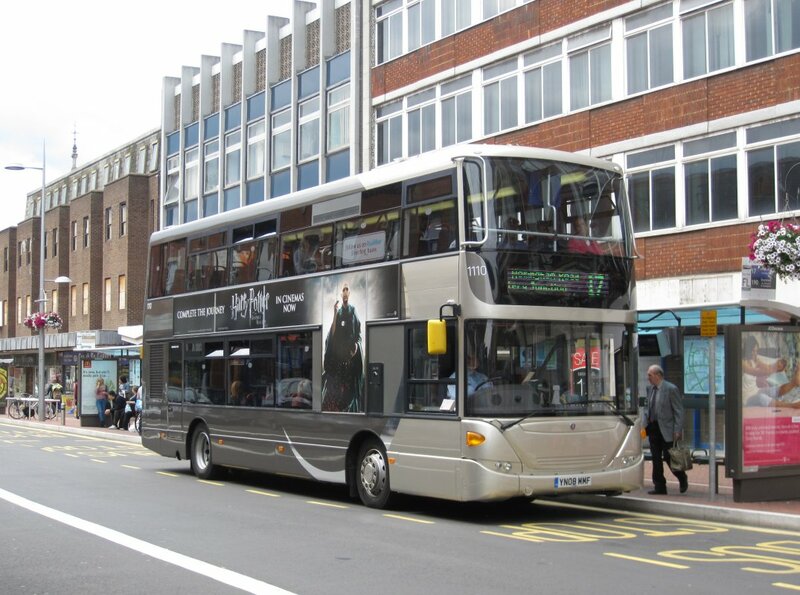 Following a severe accident in late 2016, 1101 was repainted white and given an overall wrap in generic silver advertising the Reading Buses App on 12th February 2017 before returning to service on 19th. 1102/3 were sold to Midland Classic on 19 January 2018. More information about the trial was featured on the October 2007 news page. The vehicle features a number of different types of seat inside intended to gauge opinion on the best designs. Following on from the conversion of 1101-14 from ethanol to diesel, 599 was being similarly treated by 17th May 2010 but only returned to service by 7th August 2010. 599 went on loan to Weavaway Travel on 30th January 2011 to operate route 1, and returned by 16th February 2011. It was advertised for sale instead of a Wright Solar displaced from the 1 in order to help to standardise the fleet, and departed for Stephenson's of Essex in April 2011 shortly after being withdrawn on 16th. 599 went on loan from Stephensons to Norfolk Green from 31st August 2011 to provide temporary cover on additional college contracts, returning on 17th November 2011. 1108 went on loan to Midland Classic on 29th August 2017, returning around 29th November 2017. 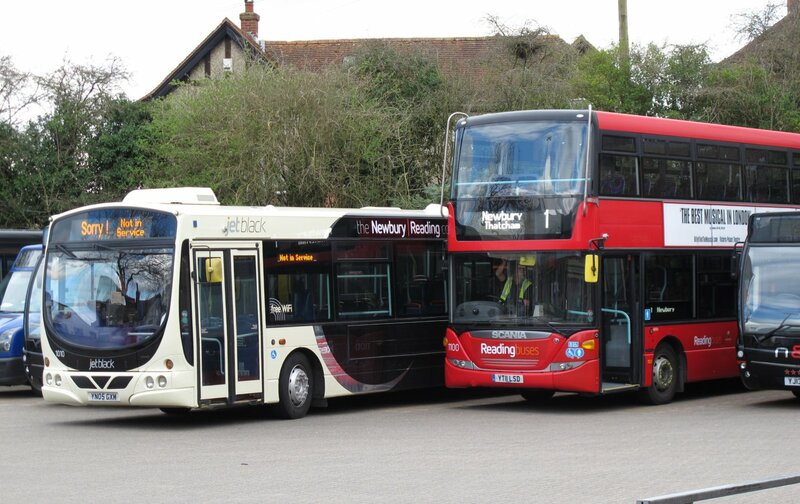 1104/5 transferred to Newbury at the end of April 2018 - 1104 for Vodafone duties and 1105 for Kennections to release Enviro 400 1214 for Greenline. 1104 immediately went away for repaint into Vodafone red, returning to Reading by 4th May and service in Newbury on 15th May, whilst 1105 operated in Pink until 1104's return and it's subsequent departure on around 25th May for repaint into Kennections livery, returning to service on 16th June.